Excavations in the Late Roman (fifth century) synagogue at Huqoq, an ancient Jewish village in Israel's Lower Galilee, have brought to light stunning mosaics that decorated the floor. The Huqoq excavations are directed by Jodi Magness of the University of North Carolina at Chapel Hill and co-directed by Shua Kisilevitz of the Israel Antiquities Authority. Sponsors are UNC, Brigham Young University, Trinity University in Texas, the University of Oklahoma, the University of Toronto and the University of Wyoming. Students and staff from UNC and the consortium schools are participating in the dig. Last summer, a mosaic showing Samson and the foxes (as related in the Bible's Judges 15:4) was discovered in the synagogue's east aisle. 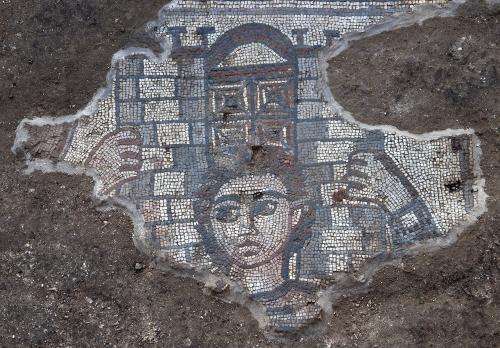 This summer, another mosaic was found that shows Samson carrying the gate of Gaza on his shoulders (Judges 16:3). Adjacent to Samson are riders with horses, apparently representing Philistines.Although he is not described as such in the Hebrew Bible, Samson is depicted as a giant in both scenes, reflecting later Jewish traditions that developed about the biblical judge and hero. Biblical scenes are not uncommon in Late Roman synagogue mosaics, but only one other ancient synagogue in Israel (at Khirbet Wadi Hamam) is decorated with a scene showing Samson. "The discovery of two Samson scenes in the Huqoq synagogue suggests that it was decorated with a Samson cycle—the first such cycle known in Israel," said Magness, Kenan Distinguished Professor in the religious studies department in UNC's College of Arts and Sciences. "A cycle is a series of scenes about Samson, in which different episodes relating to Samson are depicted." Another portion of mosaic discovered in the synagogue's east aisle preserves a scene that includes several male figures and an elephant. Below that is an arcade, with the arches framing young men arranged around a seated elderly man holding a scroll. The strip below shows a bull pierced by spears, with blood gushing from his wounds, and a dying or dead soldier holding a shield. This mosaic differs in style, quality and content from the Samson scenes, Magness said. "It might depict a triumphal parade or perhaps a martyrdom story based on Maccabees 1-4, in which case it would be the first example of an apocryphal story decorating an ancient synagogue," she said. "Apocryphal books were not included in the Hebrew Bible/Jewish canon of sacred scripture." The mosaics have been removed from the site for conservation, and the excavated areas have been backfilled. Excavations are scheduled to continue in summer 2014.